With experience and expertise that extends over three decades, BF Consulting has consistently delivered quality products and trusted service to its clients since 1982. 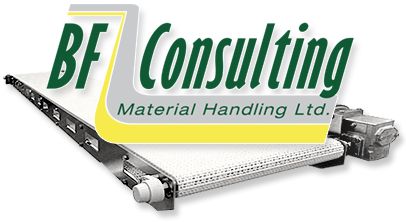 A family run business, started by founder Bruce Froom, BF Consulting is uniquely positioned as a hands-on supplier of conveyor systems and related products. Over the decades BF Consulting has developed a network of suppliers from across North America, and has achieved sales throughout Canada and beyond.. Hands on experience, not only with design and sales, but with installation and service, give us a unique perspective in the industry. We can point out the advantages and disadvantages of potential designs from both a functional and installation point of view. With a site visit, or perhaps just a telephone conversation, we can help you identify and eliminate potential hazards or difficulties and ensure worry free installation and smooth future operation. BF Consulting's ability to develop close, long-standing business relationships with many companies and has earned it a solid reputation for honesty and expertise, resulting in unmatched material handling referrals.